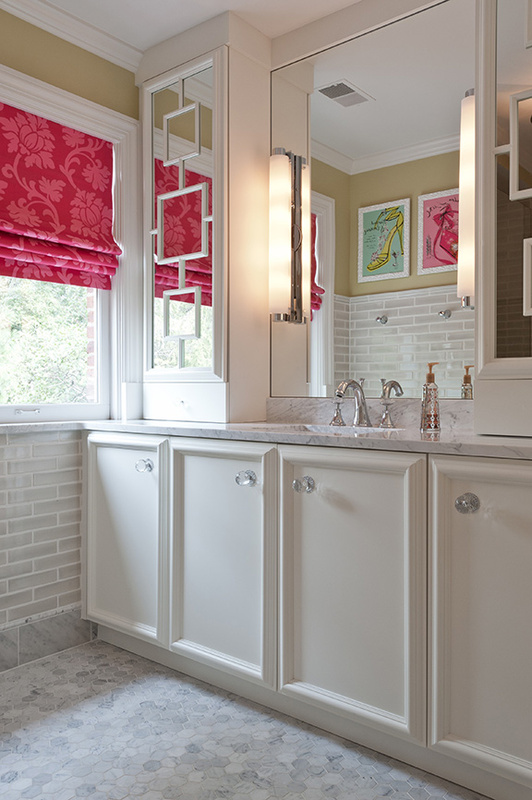 Designer ADJ Interiors was challenged in this 65-square-foot bath with creating space that could grow with a young girl from tween stage into young woman. Fun and youthful, but classic enough to carry into the teen years, the designer and homeowner came up with a bright pink-and-green color palette. The walls are washed in a pretty green with pops of pink incorporated in the custom-designed window shade and colorful artwork. The vanity was custom designed with ample storage and fantastic lighting mounted on the mirror for future endless hours of makeup experimentation. A Carrara marble top, classic polished nickel faucet and mirrored cabinet tower doors with a playful yet classic square motif complete the vanity wall. The floor features an Ann Sacks Carrara in a cool hexagon mosaic. In the shower, the tile is an artisan platinum crackle that complements the marble. This youthful space gives a chic twist on a child’s bath that will grow with her for years to come. Why the judges love it: This light and clean bath will grow with the client into her teens. We love the look of the mirrored cabinet door on the vanity. The crystal round knobs on the vanity and faucet are a nice touch.